As I've shared in the past, Minnesota can bring out the dry skin in the most moisturized person you could ever meet. Work is always the worst for me because I'm constantly washing and drying my hands. Carmex is now a staple in my file at work. I carry a bottle in my purse, leave one in my van and have another at home. Seriously, you can't live without healing hand lotion and live in Minnesota. Well, I can't at least. So, what have I learned about Carmex® after the last few weeks of use? I know that the Carmex® Healing Cream is best at work on my hands. It's rich and thick and exactly the kind of protection I need in that dry atmosphere. The Carmex® Healing Lotion is perfect for applying throughout the day when I'm at home or just futzing around. Neither of these lotions leaves a greasy feeling after applying which is important for me because I'm always touching stuff like my face and papers. Who wants to leave a greasy smudge somewhere? At work yesterday, I had just finished lathering my hands with Carmex® and my coworker came by and said, "Someone just put on Carmex®!" I laughed and wondered how she knew that and she said her husband lives by the stuff so she knows what it smells like. I wasn't sure whether that was good or bad, so I said, "Sorry," in which she replied, "No, I love it!" =) I have to admit, I do, too. The scent is very light and not overwhelming like some perfumed hand lotions can be. *I'm a Carmex blogger and received these same products for review. The opinions expressed are my own and never influenced by the company. The CARMEX VANILLA STICK would be very helpful for me. I've always had such dry skin and the back of my legs always look like snake skin, gross i know. I'd love to try the healing lotion to see if it fixed that! The CARMEX ORIGINAL HEALING OINTMENT is something that I would like to try this winter. I would love to try out the healing lotion. My back gets really dried out in the winter months. I'd love to try the Carmex Original Healing Ointment on my dry skin. Thank you! I want to try the Carmex Lime Twist stick. 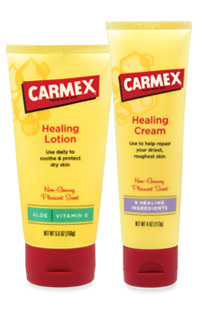 I'd love to try the Carmex Healing Lotion! I would love to try the Carmex Original Healing Ointment. "Down" here in Wisconsin, we have the same trouble with dry skin in the Winter. We don't even have snow yet and it's started already :) I'd love to give this a try. Thanks so much for the chance! I love their lip balm, of any flavor! I have always been a fan of their lip balms and keep one with me at all times especially in the winter. I would like to try the Moisture Plus Lip Balm in Sheer Peach. I'd love to try the carmex healing ointment for my extremely dry skin..